Homemade Brownies – chocolatey, chewy homemade brownies made from scratch with a flaky crust. NO mixer required and with just the right amount of sweetness to linger in your mouth. You’ll never open boxed brownie mix again! Okay, here’s a little confession that I have to make: I’m a boxed brownie mix fan. Like a huge fan! I have this go-to brand that I always have in my pantry in case I get the hankering for some brownie bites. And I’m not ashamed of that. Although I always prefer the made-from-scratch dish, sometimes I just get a little impatient with all the measuring the ingredients and stuff. Throwing a brownie mix straight off the box and into the bowl makes it quicker and easier to deal with my food cravings and “hangry” moments. 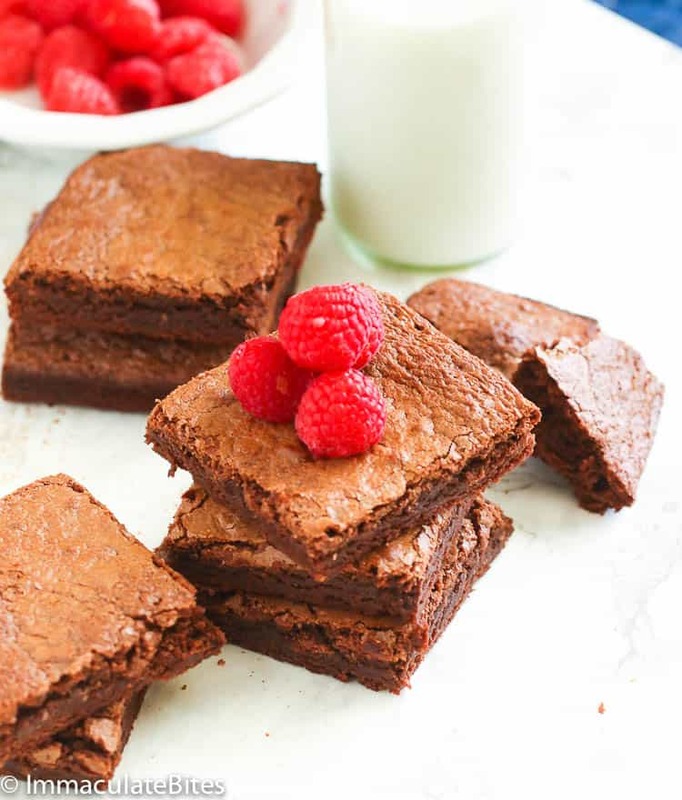 Until….I found out the perfect brownie formula that suits well to me. This is by far the perfect homemade brownie mix for me. Not too sweet, too cakey or too fudgy! I prefer mine to be less thicker than the usual, chewy with flaky crackly crust on top. 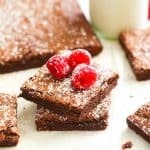 To make this homemade brownie, you start with melting the chocolate chips or chunks + butter in the microwave until it’s smooth, shiny and completely melted. In a larger bowl, you whisk the eggs and adding subsequently the white, brown sugar, vanilla and salt. Whisk to combine. The next part is crucial tho. Gently stir in the melted chocolate mixture and fold in the flour and cocoa powder. Try to control yourself not to lick clean the whole bowl at this point. NOTE: Do not over beat your batter after you fold in the flour and cocoa powder as it creates air pockets in the batter that will result to a cake-like textured brownies. Another thing, DO NOT over bake as it will continue to bake slightly in the hot pan after you pull it out of the oven. That’s how easy this homemade brownies is, and I kinda regret not trying it out too soon. You don’t even have to use a mixer! Oh well, you could just imagine how my house smell as it bakes. It was pure happiness! The hardest part of it is waiting for it to completely cool down before I can happily sink in my teeth onto those brownies slab. dried fruits like dates, raisins, cranberries, and etc. Anything you like! That’s how good a brownie is. You can serve it as simple as this or go overboard with the add-ins. But mind you, that makes it even harder to stop munching on these homemade brownies. Serve with it hot or cold milk, ice cream on top or dust it with a sprinkle of powdered sugar. 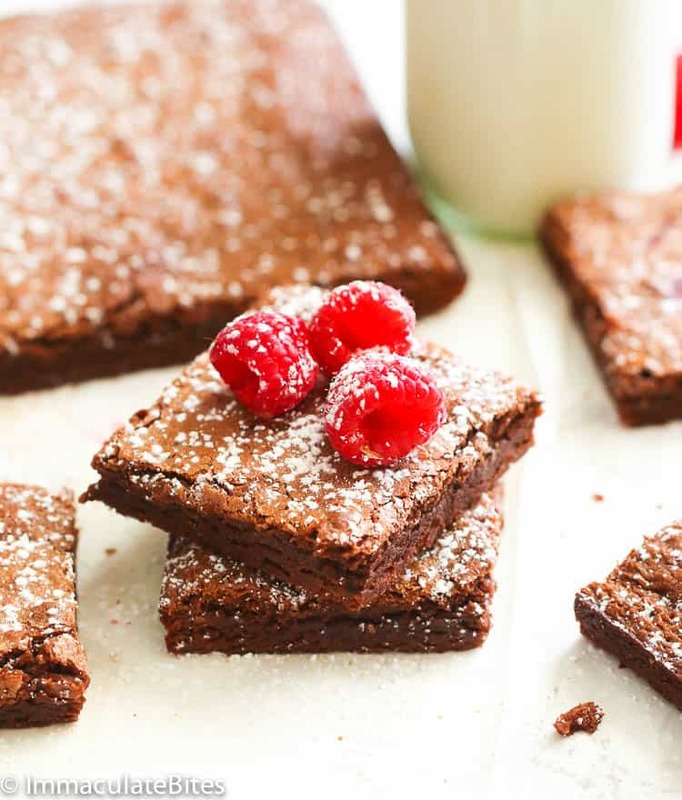 You will never EVER going to break another boxed brownie mix again. Nothing beats homemade versions of this comforting and indulgent baked treats! Want another baked treat to happily dig in on Christmas morning? Try this Monkey Bread, Pecan Pie or Chocolate Chip Banana Bread. They’re all a cinch to make! Do not over beat your batter after you fold in the flour and cocoa powder as it creates air pockets in the batter that will result to a cake-like textured brownies. Do not over bake as it will continue to bake slightly in the hot pan after you pull it out of the oven. 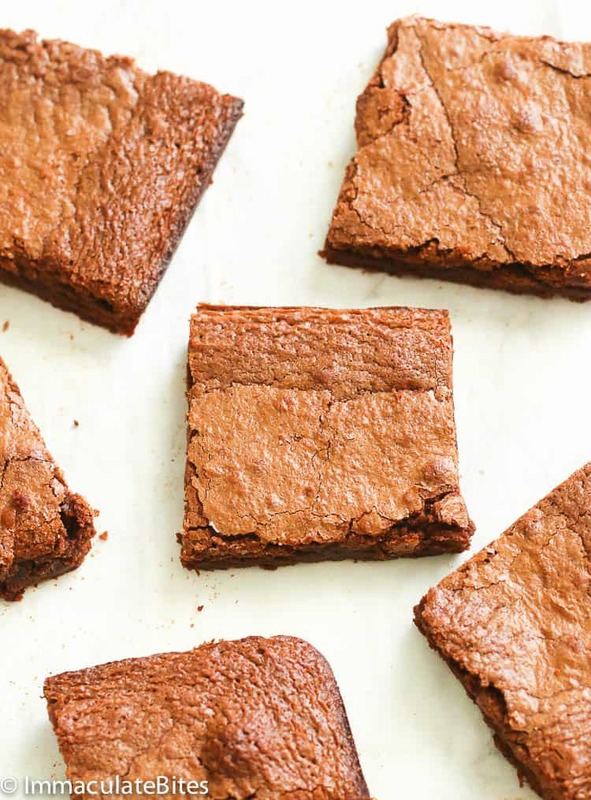 For a thicker brownie, use an 8 x 8 inch baking pan. You can store them in room temperature for 3 days or in the fridge for up to 5 days. Homemade Brownies - chocolaty, chewy homemade brownies made from scratch with a flaky crust. NO mixer required and with just the right amount of sweetness to linger in your mouth. You'll never open boxed brownie mix again! Spray a 9″ x 13″ or 8×8 inch baking pan (for thicker brownie) with oil spray and line with parchment paper. Then grease with butter or baking spray. Set pan aside. Combine the chocolate chips or chunks and butter in a medium bowl. Then melt in the microwave, stop and stir frequently every 20-30 seconds so that is doesn’t scorch or burn. It usually takes about 2 minutes. Stir the chocolate continuously until it is smooth, shiny, and completely melted. If microwave is not your thing, then melt in a double broiler over medium heat stirring occasionally until melted. Whisk together eggs in a large bowl. Add sugar, brown sugar, vanilla, and salt; whisk to combine. Stir in melted chocolate mixture; then gently fold in flour and cocoa powder, until thoroughly mixed . Pour batter into prepared pan; spread evenly. Bake until a toothpick inserted into center comes out clean, 30–35 minutes. Let it cool, slice and serve with milk and topped with whipped cream, if desired. Preheat oven to 350 F Degrees. 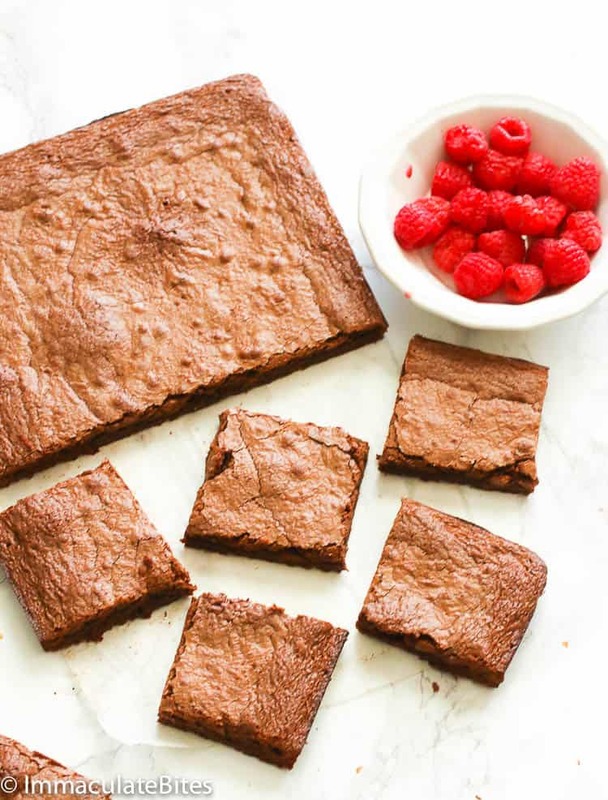 Spray a 9″ x 13″ or 8×8 inch baking pan (for thicker brownie) with oil spray and line with parchment paper. Then grease with butter or baking spray. Set pan aside. Combine the chocolate chips or chunks and butter in a medium bowl. Then melt in the microwave, stop and stir frequently every 20-30 seconds so that is doesn’t scorch or burn. It usually takes about 2 minutes. Stir the chocolate continuously until it is smooth, shiny, and completely melted. If microwave is not your thing, then melt in a double broiler over medium heat stirring occasionally until melted. Whisk together eggs in a large bowl. Add sugar, brown sugar, vanilla, and salt. Whisk to combine. Then stir in melted chocolate mixture. And gently fold in flour and cocoa powder, until thoroughly mixed. Pour batter into prepared pan; spread evenly. Bake until a toothpick inserted into center comes out clean, 30–35 minutes. Let it cool, slice and serve with milk and topped with whipped cream, if desired. I do not think my wife will stand for that at all. No, we’ll just have to figure out how to give away some of these to grateful neighbors. Well, that is unless we go ahead and eat them all ourselves. 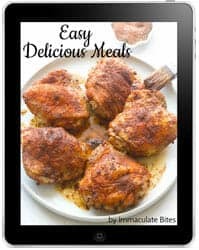 Thank you for this recipe; yet again. You are amazing, and my favorite food blog.